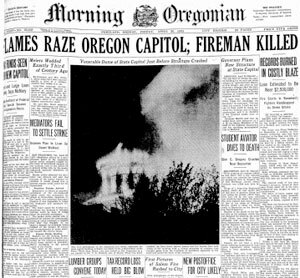 Floyd McMullen of Hermiston, a nineteen year old Willamette University student employed at Salem’s East side fire station, was the sole victim of a fire that destroyed Oregon’s capitol building on April 25, 1935 (The Morning Oregonian, 26-April-1935). McMullen, while aiding in fighting the blaze, was struck on the head by a falling cornice. He was rushed to the hospital, where he died a few minutes later. Janitor Rodney Mapes telephoned the fire department around 6:40pm when he discovered the fire, which was confined to the basement when firefighters arrived. Within a half hour the flames shot upwards through hollow pillars from the basement to the corridors and up the elevator shaft. This provided a suction which, with open windows made necessary by the dense smoke, caused the blaze to spread rapidly. After reaching the top of the elevator shaft the flames burned away the woodwork and soon shot out the roof. Tongues of flames could be seen for many miles. 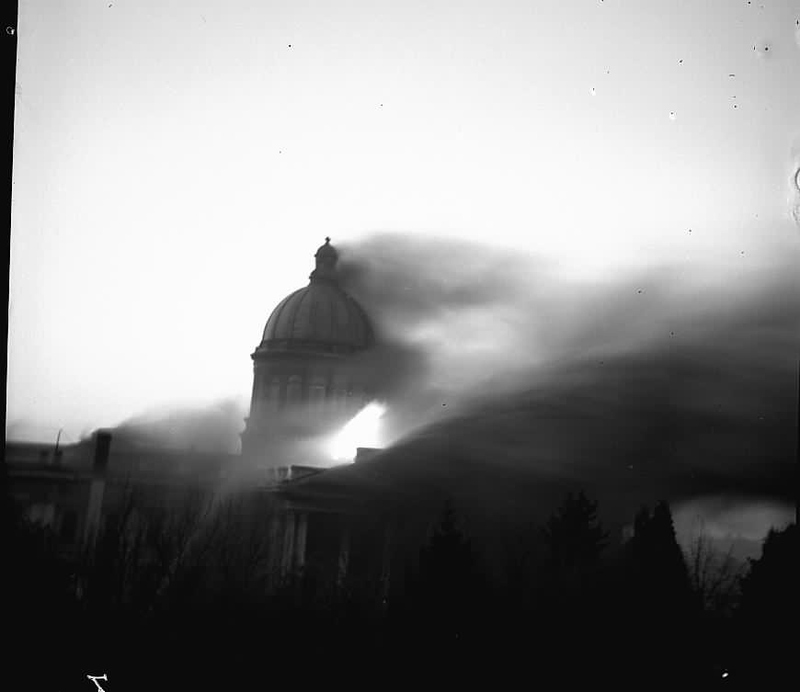 The heavy copper dome collapsed at 8:01pm, throwing flames, sparks and fire brands from both wings of the building with a vicious smashing of windows that brought gasps from the hundreds of spectators. Fortunately the firemen had evacuated the building moments earlier. The four story Modern Greek-style capitol we know today was dedicated on October 1, 1938.